Somehow I got on the March of Dimes mailing list. March of Dimes sends out solicitations several times a year. Most junk mail is worthless. 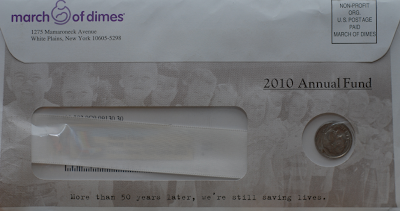 The March of Dimes "junk mail" that I just received came with $.10! Thats right, the mailing had a dime attached to it. Pretty sweet. Easy money just for being on someone's mailing list. So hurry up and add yourself to their mailing list so one day you too can open up your mailbox and find FREE MONEY!